JPL, Caltech, 4800 Oak Grove Dr. (82-105) Pasadena, CA 91109. Inspection in field conditions is labor intensive, demands great attention to details, subject to human errors and the reliability is limited. The interpretation of the data depends critically on the inspectors' experience, competence, attentiveness and meticulous dedication. For instance, rivet crack detection by eddy current is known to be a mundane and painstaking task, which can involve loss of the inspector concentration during a long inspection session. On the other hand, disassembly of structures and inspection in laboratory conditions is costly and in many cases it is not practical. These inspection limitations are hampering the growth in usage of composite structures for construction of aircraft since these structures are sensitive to impact damage that can occur at any time and any point over large areas. Also, there is an increasing need to perform rapid large area inspection of aging aircraft. For military aircraft, an additional constraint that may need to be accounted is the potential requirement to operate also at harsh, hostile and remote conditions (extreme temperature, battlefield, remote expertise, etc.) with minimum human interference. To overcome the limitations of standard NDE methods, reliable field inspection systems are being developed for rapid NDE of large and complex-shape structures. In recent years, various types of portable scanners were developed for rapid operation in field conditions using such NDE methods as visual, eddy currents, ultrasonics, shearography, and thermography. The development of automatic scanners made the biggest impact on the wide use of such methods as ultrasonics NDE, where detailed images are produced showing the location and size of flaws. Such scanners provide a consistent data recording and allow the application of simple reception/rejection criteria. For a long time, the automated inspection capability (also known as C-scan) was available only for lab conditions, while field inspection was performed manually. The emergence of microprocessors enabled to perform contour following of structures and allowed inspection in coordination with the details of CAD drawings. Full aircraft structures, such as the wings of the Harrier, are now tested routinely by such systems in lab conditions. With the evolution of personal computers and microelectronics, it became possible to produce portable scanners that can operate in the field . The original portable scanners were relatively heavy and consisted of a simple bridge with portable set of boxes that were carried to the field to perform scanning, data acquisition, imaging and storage. To support the formation of the C-scan images, encoding methods were developed to acquire the probe location information while operating on aircraft structures directly in the field. Such position encoding methods include the use of acoustic waves, optical scales, and various others. Due to the inaccuracy of the acoustic encoding it was phased out and most of the current portable scanners rely on optical encoders. To inspect vertical areas and bottom surfaces of aircraft structures, strapping techniques and vacuum suction cups are employed securing the attachment of the C-scan bridge setup. Since aircraft structures have a complex geometry, the use of flat portable C-scan bridges is involved with great difficulties due to the gap that is formed between the straight bridge and the curved surface of the aircraft. Flexible scanners, such as the PANDA Scanner (made by Tektrend) are now addressing this issue employing a arms that flex and conform to the surface contour, thus ensuring contact between the transducer that test surface. The introduction of portable c-scan bridges enabled the automation of ultrasonic field inspection and significantly improved the reliability of field tests. However, such scanners provide an effective inspection capability only over the area that is covered by the bridge of the scanner. Covering a large area of an aircraft requires multiple scans where the operator moves the scanner from one location to another while forming scan-tiles to cover the full structure. Fig 1: MACS crawling on the C-5 aircraft (patent pending ). Automated devices that can be attached to an aircraft skin and travel on it while scanning and inspecting it can greatly expedite the rate of inspection and minimize human interference. Increasingly, crawling devices are reported as a solution to the need for mobile unconstrained scanners. The use of suction cups has become a leading form of controlled adherence to aircraft surfaces and several successful devices have emerged in the last several years. 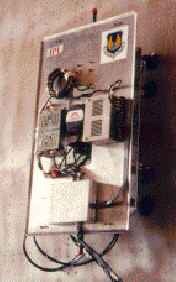 The Automated Non Destructive Inspector and the Autocrawler are some of the more known mobile portable scanners [1-2]. In recognition of the need to have a compact, more maneuverable crawler, JPL recently developed a small, highly dexterous crawler with a payload to weight ratio of about 10:1. This Multifunction Automated Crawling System (MACS), shown in Figure 1, was designed to perform complex scanning tasks . MACS employs ultrasonic motors for mobility and suction cups for surface adherence. It has two legs for linear motion, with one leg serving as the rotation element for turning. This mobility configuration allows performing any simultaneous combination of motion, including linear travel as well as rotation around the central axis. MACS can be applied to inspecting of composite and metallic structures for detection of cracks, corrosion, impact damage, unbonds, delaminations, fire damage, porosity and other flaws, as well as paint thickness measurement. Also, this crawler can be used to identify dents and individual fasteners. The development of MACS was benefited from the ongoing JPL development of miniature planetary rovers, as demonstrated with the Mars Pathfinder, as well as telerobotic technology and NDE techniques. Autonomy of NDE crawlers is a key technology for the automation of such devices for field scanning of complex aerospace structures. An autonomous crawler can be monitored remotely by centrally located experts that are equipped with know-how, database, analytical tools, CAD drawing, and accept/reject criteria. Such a capability will allow rapid response to inspection needs, particularly in cases of crisis where it is necessary to rapidly examine a full flight of a particular aircraft model all over the world. An autonomous crawler can be operated during aircraft idle time allowing to reduce the need to ground aircraft for inspection. A combination of visual, eddy current and ultrasonic sensors are expected to be the leading NDE methods that are used on autonomous crawlers. The technology that can enable such capabilities has been in development at JPL for the exploration of Mars, where the Mars Pathfinder already enjoyed some of its benefits. Miniature robotic technologies with on-board intelligence are being developed for future missions where the rovers will examine, select and collect samples from Mars while avoiding obstacles during operation in an unknown terrain. Since communication between Earth and Mars takes about 12 minutes each way, the need for autonomous operation rather than remote control is critical to the success of the missions. The JPL's crawler MACS is currently using umbilical cord for power, communication/control and to provide air pressure for the ejection and activation of the vacuum suction cups. Future efforts will involve increased autonomous operation and a complete wireless communication. Potential future development includes a miniature on-board vacuum pump, power and computing capability. Further, intelligent NDE techniques can be used to allow detection and characterization of flaws and material properties determination . Crawlers can employ local Global Positioning Systems (GPS) to determine the absolute coordinates without the need for complex, costly and heavy encoders. Further, such GPS systems will allow relating the location of the crawler on the aircraft to the detailed drawing and assist in the data interpretation and flaw location and identification. To protect aircraft elements that rise above the surface from accidental damage, a virtual vision system will be used with collision avoidance software. To enhance the inspection capability of the combined systems, a neural network data interpretation can be used. MACS can be controlled remotely via the use of Internet allowing multiple users to control it using password and thus limiting the access to the control capability. The personal computers technology offers a model for smart mobile platforms (crawler, boro-robot, etc. ), namely the establishment of an equivalent to the motherboard. Various companies are making components of a PC allowing them to concentrate on their strength and innovation, rather than having to produce a complete new PC each time they launch a new product. As an example, manufacturers of internet cards or modems can concentrate on improving their product without having to make a complete personal computer. The key issue is that these companies can concentrate on the specific product area while complying with the evolving mother board architecture. Crawlers can be developed as a mobile platform similar the idea of the motherboard on the PC providing a scanning, power, intelligence and communication capabilities. The crawlers can be produced by telerobotic companies, which will have standard bus architecture offering a plug-in capability for miniature NDE instruments. This will allow the NDE industry to concentrate on making unique miniature instruments modules for plug-in onto the crawlers and making driver software that will allow the microprocessor on-board the crawler to control the modules. This field is multidisciplinary and just as in the case of the PC technology it is very difficult for a single company to poses all the necessary expertise. This approach will allow diversity of the companies that can contribute to the field as well as the ability to standardize the products for a larger user base and thus significantly reduce its cost offer a greater pool of capabilities. The engineering side of the crawler technology involves the development of the platform components including the power supply, mainframe, bus and wireless communication, position tracking (local GPS, encoders, etc. ), controlled sticksion, actuators and motion control. In the area of NDE instruments miniaturization, the field is starting to see some progress but there is much work that needs to be done and more companies need to be involved. JPL is offering MACS as a baseline for an industry standard. The micro-electronic mechanical systems (MEMS) technology offers a basis for future generations of extremely small scanning NDE instrumentation. The author has taken an initiative with ASNT to have Sessions on Robotics Miniaturized NDT Instruments in each of the ASNT conferences since the '96 Fall Conference, which was held at Seattle, WA. The objective is to establish the foundations for autonomous crawler technology for robotic inspection. The author is seek to nurture the growth of the pool of companies that are joining this initiative and contributing to the availability of miniature instruments that can serve as modular plug-ins. The research described in this manuscript was initiated by the Jet Propulsion Laboratory (JPL), California Institute of technology, and sponsored by AFOSR grant F49620-95-1-0518 monitored by Dr. Spencer Wu, through an agreement with the National Aeronautics and Space Administration. The development of MACS was done under a contract from the Air Force Material Command, Kelly AFB, FD2050-95-64062, entitled "Miniaturization Technologies for Aircraft Inspection." P. Backes and Y. Bar-Cohen, "Miniaturization Technologies for Aircraft Inspection," JPL, Pasadena, CA, Report D-13876, (July 1996). V. Bahr, "Wall-Climbing Robot in Non-Structural Environment," Transaction Robotics Research, Robotics International, Society of Manufacturing Engineering, Vol. 2 (1992), pp. 1-24. Y. Bar-Cohen, B. Joffe and P. Backes "Multifunction Automated Crawling System (MACS)", Disclosure of New Technology, Item No. 9460, Docket 19847, November 29, 1995. (Patent Pending, CIT 2432, Submitted on August 1, 1996). C. A. Vazquez and Y. Bar-Cohen, "Application of Artificial Intelligence to NDE," Report No. K4870, (MDC, Long Beach, CA. April 1990) pp. 1-32.